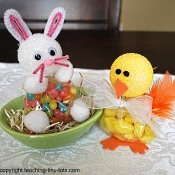 Toddler Activities: Cute Basket Filler! 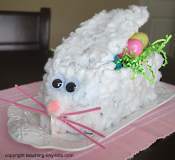 Make a styrofoam chick or bunny. 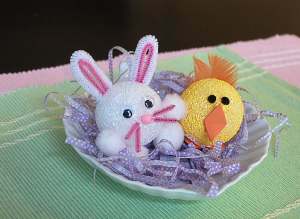 Here is a cute bunny and chick your child can make. Easy classroom activity. Two mini pom poms or black beads for eyes. Cut pink pipe cleaner about 1.5 inch for each ear and cut the white about 2 inches for each ear. Bend the pink pipe cleaner in half and poke gently into styrofoam ball. Poke the white pipecleaner on one side of the pink and bend over the pink one and poke into styrofoam ball on the other side. Glue on the wiggly eyes and pom pom nose. Glue on pom pom feet and hands and tail. Cut four pink or white pipe cleaners about an inch long. Poke into styrofoam ball near nose for whiskers. Paint styrofoam ball with yellow paint. Let dry. Fold piece of foam or felt in half and cut a small triangle. When opened it should form a diamond. Glue onto styrofoam ball where the fold is. Fold foam again and cut a heart out for the feet. Glue on the bottom of the ball. Glue on mini pom pom eyes. Press ball gently on a flat counter or surface. It will flatten the bottom making your bunny or chick able to sit. 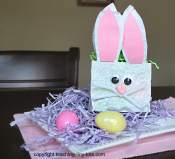 Use felt, foam, construction paper or other materials to make eyes, nose to get a variety of features. 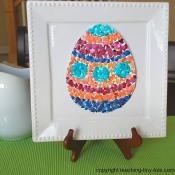 Mount it on a piece of cardboard to make an Easter scene. Put in a clear goodie bag with some candy to make a cute gift. Pet rabbits kept indoors are referred to as house rabbits. Rabbits can be trained to use a litter box and there are some that can even learn to come when called. However your house must be "rabbit proofed". Rabbits will chew electrical cords, wood and carpet. Some pet rabbits live outdoors in hutches if the weather is amenable. Due to their fragile nature, rabbits are best pets for children at least 10 years of age. Rabbits have a relatively long life span of 6-7 years or more.